This cartoon has several layers, not all intended by the artist: it obviously condescends to manual workers, who are presented as unable to comprehend the supposed higher value of amateur sport which they judge solely in terms of the energy expended. The fact that the varsity oarsmen work so very hard is, moreover, taken by these manual workers as a sign that they must be paid for piece work rather than working on a fixed salary. 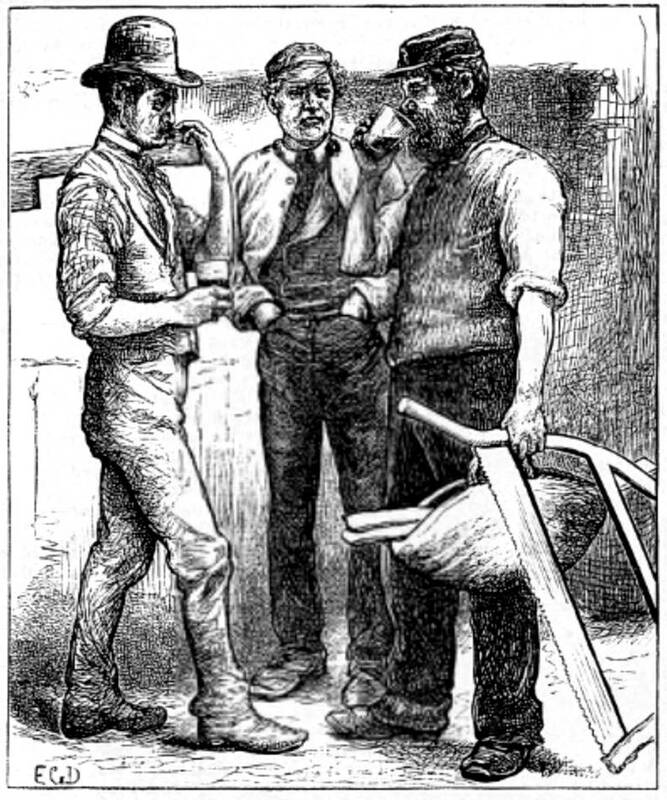 Assuming that all manual exertion could only be for pay, the speaker is doubly shocked because the men in the boat or boats both sacrifice their beer (to stay in training) and receive no financial reward. He therefore concludes that such effort is “a takin’ the bread out of the workin’ man’s mouth.” This class-based humor derives from condescension of the working man’s inability to appreciate amateurism, university sports, and the character-building effects of athletic competition.